SM- OK, I'm still trying to find my "niche" for where to post this blog. I'm also trying to blog to share thoughts and feelings, rather than treat it like each post must be a well-polished, finished product. So this will be my first attempt at a "just blog it" type entry. This week, while loading up the car to take my daughters to school, I had a thought. 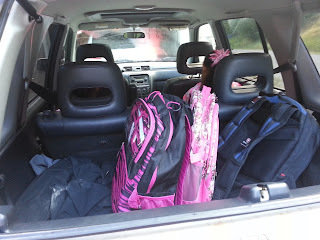 Hey, the girls are big enough, they can put their backpacks at their feet in the car and just get out on their own when I drop them off rather than the usual stop, get out, get their bags from the back hatch and off they go. My initial feeling was that it would be easier and quicker. But then it hit me, in that "back to school" nostalgia sort of way. You know, that feeling you get when your kids are starting another school year already, and Summer zoomed by, and they seem so grown up. I needed that moment, in more ways than one. So I decided to put the backpacks in the back, in our traditional spot, because in doing so, I was strategically manufacturing an opportunity to give both of the girls a big hug before sending them into the their school. That moment started much more. Once in the car for our 2 car caravan (My wife teaches at our district's only HS a half-mile from my office and the girls' school and drives herself) we hit the road for our 3 mile, 6 minute commute. OK it's 7 minutes if traffic (school buses and a few cars) is heavy. Anyway, we were listening to music an singing, which is another tradition for me and the girls, when the lyrics of the song went straight to my heart. All of a sudden, I began to really examine my attitude and how I interacted with others. By others I mean my family, coworkers, and even other people I encountered during our commute. You see, the first week "back to school" wasn't my first week because I have a longer contract, but it's always the busiest and most stressful. I must confess that I had several moments of bitterness and frustrations, but at this moment I was being made aware of how I was missing one big piece, and I was so amazed at how directly applicable this piece was to both my life, and my job, and yes, even education. That piece that I was missing... true empathy. We all have struggles, stresses, and difficulties that we encounter. Heck, this week I had several moments of "can I do this?" and "How am I going to make it work?" Life is kinda cruel that way at times. So why not take our own worries and challenges and consider the other people we encounter? That person that cut you off at the 4 way stop? They might be losing their job. The co-worker that ignored your email? They might be facing incredible sadness due to illness or hardship in their family. The student who doesn't seem to care? Maybe his parents are fighting nonstop and verbally abusing each other. But what if we made an effort to consider these possibilities every time we were "wronged" or wanted to lash out or be bitter? What if we showed genuine kindness and grace? What if we "looked like love?" I had a hard time formulating this post because the "look like love" concept isn't just a family or friend thing. It's more than that. It is a recipe that will work anywhere. I am an educator, as is my wife and other family members and friends too. "Look like love" will never fall void. Look like love to your students. Really find out what makes them tick and what may be affecting them daily. You want to see achievement go up? Look like love. You want fewer discipline problems? Look like love. You want students to engage and show ownership in learning? Look like love. I've been seeing a lot on social media and on the news all the polarizing and mind numbing mud slinging about education and what's good, terrible, and who is to blame. But there is one thing that cannot be argued. Showing love, compassion, and empathy to others... really caring about students and giving all that you have will do more than any "reform," pedagogy, technology, theory, or style. It's simple... Look like love. Our homes, workplaces, and communities will be better exponentially. We will still have "off" days or times when we fall short. But I think that will be the time someone else might "look like love" for us. Are you ready to look like love?